All of the species ids are approximate and to the best of my ability. In many cases with the soft corals and in some cases with hard corals exact id of the organism may be impossible without knowing the locality and depth at which the particular specimen was collected. In only a very limited number of cases do I have such information. Even then, the microscopic examination of the coral skeleton or sclerites (in the case of the soft corals) may be necessary to get exact species identification. The species ids are listed only to give a general idea of the morphology and proper case of the particular coral. 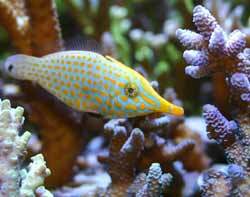 Please, no flames on the keeping of the long-nosed filefish (Oxymonacanthus longirostris)! This fish is an obligatory coral polyp feeding fish, and is extremely common on Indo-Pacific reefs. When scuba diving I've noticed one of these fish hovering over almost every Acropora head. I've had the fish now for about five months (Sept 2004). The fish was very thin when I purchased it. I started the fish out in my frag tank and it quickly put on weight. The photo is from its time in my frag tank. I later moved it to my main 110 gallon SPS tank where it has continued to thrive, becoming positively rotund. Since it is a small fish it has not done any significant damage to any one coral in the tank. It clearly prefers some Acropora to others, but it also samples Pocillopora and Hydnophora as well. The fish has not taken any prepared food to date.